We recently had the pleasure of working with Project Belle, as they are a great service to brides or anyone. They are able to send a yoga instructor to your hotel if you decide that you need to work on your chakra before your wedding or a bridesmaid missed her spray tan appt. & still needs one, Project Belle can help. We spoke with Carlin that handles Operations to tell us more about the company. What made you go into the business of …...? The founder of Belle, Armand Lauzon, has a cousin who is a manicurist. While spending time with her, she explained that Professionals in her industry forfeit anywhere between 50% to 85% of the revenue they generate to a salon or spa to pay for rent, utilities, marketing, etc. Manicurists also need to abide by strict shift schedules where they ultimately waste time waiting for appointments to walk through the door. Armand knew that technology could improve Professionals’ compensation, save them time, create flexibility and best of all - bring Clients a new type of service with superior convenience. 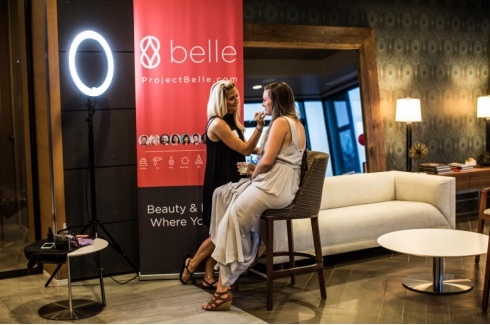 Belle brings beauty and wellness services to Clients, hassle-free. Massage, hair, nails, makeup, skin care, fashion and fitness wherever they are, including their homes, offices and hotels. You name it. We’re there. All payments are digital and include tip, so every experience is simple and convenient. There are a number of ways brides can use our services! You can book ad-hoc any services you'd like for your big day or e-mail support@projectbelle.com to allow us to help you organize your needs and wants. Let's face it, wedding planning can be overwhelming so knowing that your beauty and health services are taken care of with Belle brings a sense of peace!